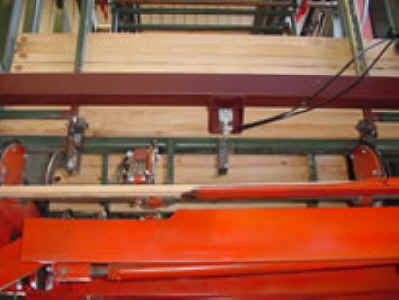 The High Speed Dual Fork Stacker Systems typically operate at 18 to 24 solid piled layers per minute with speed settings based on the product size and grade to be stacked. The systems drives and positioners are either a combination of hydraulic and electric components, or 100% electric for a hydraulic free system. The Dual Fork Stacker is covered by US Patents 7201554 and 7651314, and Canadian Patents 2463210 and 2590852. Product sizes we typically process are 6′ to 16′ or 6′ to 20′ lengths, 1″ to 4″ thicknesses, and 4″ to 12″ widths. We have a system out that’s running 6′ to 32′ lengths with 4″ to 12″ widths and 4″ to 12″ thicknesses – that’s right – .it stacks 12″ X 12″ timbers by 30′ long along with 1″ X 4″ up to 8″ X 8″ up to 32′ long! The Dual Fork Stacker is like having two stackers in one machine. 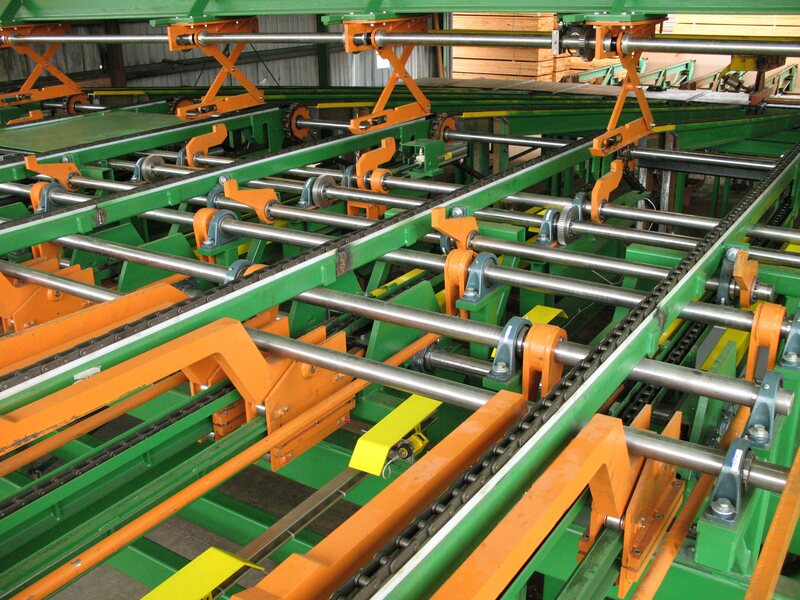 The mills run the arms in dual fork mode for higher speeds, or either single fork alone when maintenance is required on the other fork, or both forks together when stacking timbers. This allows for near continuous production, and that makes everyone’s job easier, and more efficient. The unique design of the Dual Fork Module allows the system to replace your existing single fork mechanism, saving your unscrambler, stacker frame, primary and secondary package accumulation hoists, the strip layer, and out feed conveyors. We have provided systems with Allen Bradley SLC5E or Contrologix L61 controls. We provide the operators console with touch screens as well as complete panels to house the controls system.